For cities, snow can be the great revealer. Each path of footprints illuminates where pedestrians are walking, and places they avoid. Tire tracks carve out temporary bump outs, public spaces, and lane diets in the snow, revealing how much room we should actually be allocating to cars in our streets. Warm pipes beneath the road melt away an ethereal map of infrastructure that is usually hidden beneath the pavement. Snow also reveals a lot about the people around us. Cities by their nature reinforce a certain degree of tolerance and consideration for other people. To share a small area with a great number of people of diverse backgrounds and perspectives would be impossible without some shared understanding of mutual responsibility. We all know that the level of respect and consideration for others varies greatly among those we encounter in the day-to-day of urban life. Seldom is that reality more evident than when it snows. Most of the time, the intentions and behavior of our neighbors is hidden in the anonymity of urban life. But when it snows, everyone’s civic mindedness is laid out for all to see. Each shoveled sidewalk is a recognition that other people are living around us, and a commitment to that fundamental premise of urbanity that we all do better by working together. Snow reveals those around us who are truly our neighbors, and those who are merely strangers living in close proximity. And while it is fascinating that snow can provide a tangible, physical manifestation of that amorphous concept of “community,” it does much more. Snowfall is remarkably adept at spurring spontaneous acts of neighborliness. From the the person who shovels their elderly neighbor’s sidewalk to the flash mob of neighbors who often appear from nowhere to push a stuck car to freedom, snow brings people together. When we see someone trudging through snow, or spinning their wheels, we recognize that their plight is our plight. When we shovel a sidewalk, we acknowledge that in helping others, we make a better city for ourselves. In that spirit, Urban Angle presents the snow removal edition of Cheers and Jeers. 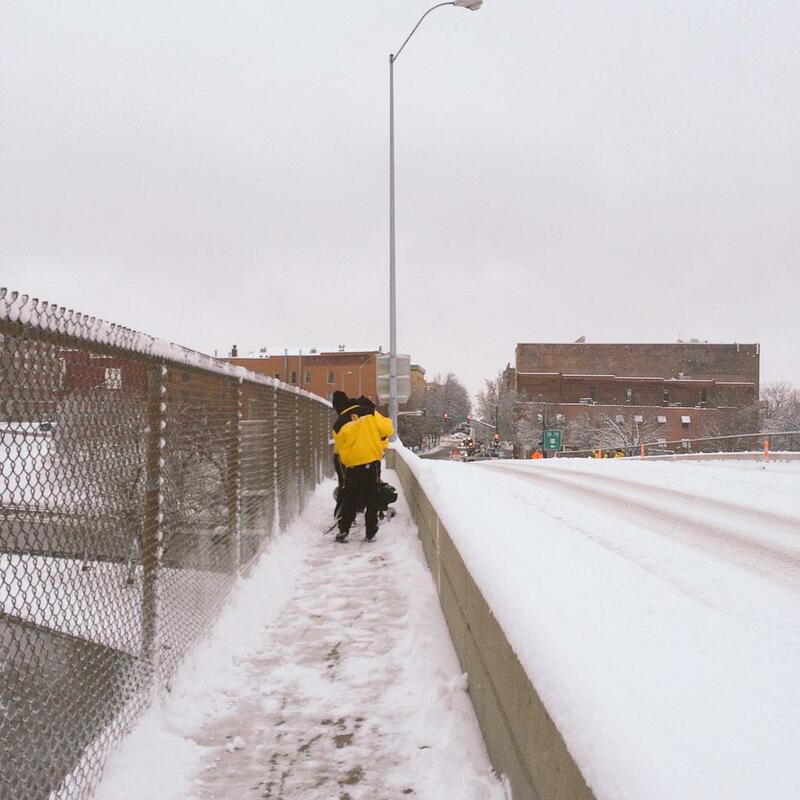 Everyone who shoveled a neighbors sidewalk yesterday, including the CID who got up early to take care of the highway overpasses. Everyone who immaculately plowed their parking lot and placed that snow in a giant mountain directly on the sidewalk. This behavior is rampant across the City and is actually far worse than not shoveling. It forces pedestrians into the street, and lasts as a barrier long after the snow has melted everywhere else. What’s the best way we can combat this? Public shaming is one thing, but I’m sure many of the business owners don’t even realize they’re impeding. 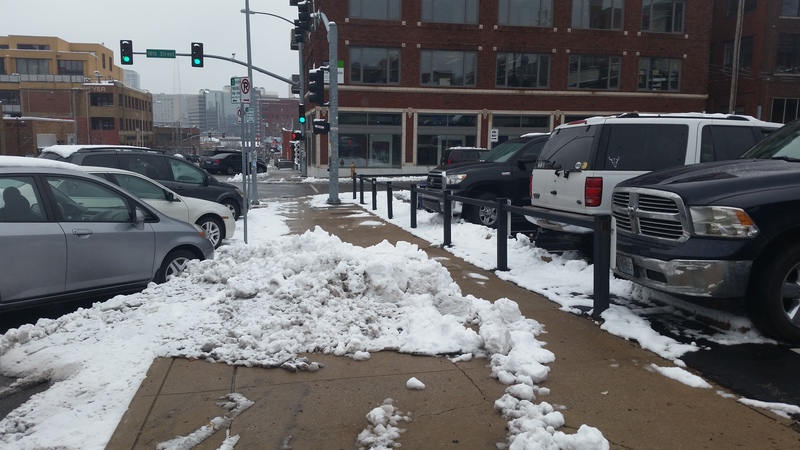 The City does have an ordinance that requires shoveling of sidewalks, but it is difficult to implement because it has a grace period, and often snow melts before the ordinance is triggered. I think you are right that sometimes speaking to property owners is helpful. 2009-2010, but still could happen. Jefferson Street was under 3 inches of ice for weeks, and the plows left the side cuts in the streets downtown like this. No where to park on the street. That is bad, but at least they didn’t shove it on the sidewalk as often happens! “To share a small area with a great number of people of diverse backgrounds and perspectives would be impossible without some shared understanding of mutual responsibility.” I love that, well put. That first picture is right outside my church’s front door (the picture is at 18th and Baltimore). 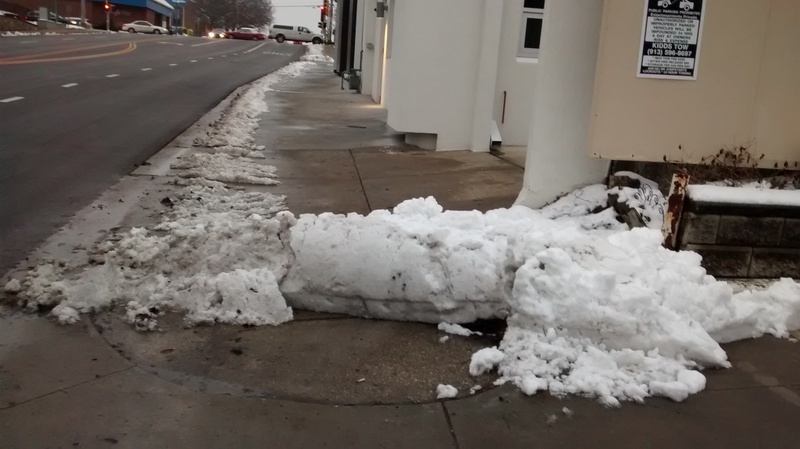 That pile was placed after our members shoveled most of that sidewalk off. Frustrating. I’m sorry to say that your neighbor is a chronic problem when it comes to snow removal. In the past, the mountain of snow on the sidewalk there has been head high when the rest of the snow in the City has melted. I’ll scold them next time I see them. I KENT say who is respONsible for this for SECURITY reasons. I’m sure you understand. Have you read “Happy City” by Charles Montgomery? It’s a great breakdown of the concept you addressed earlier with people getting along. Great read.